1　Part of the kitchen and private residential zone of an Edo period daimyou 大名 residence. 2　In the private residential zone oooku 大奥 of the main ward *honmaru 本丸 and west ward nishi-no-maru 西の丸 of Edo jou 江戸城, part of the female attendents' quarters or tsubone 局. 3　In Edo period farmhouses nouka 農家 and townhouses *machiya 町家 in the Kansai 関西 region, a raised timber-floored area, like an internal veranda *engawa 縁側, that borders the edge of the kyoshitsubu 居室部 and projects into the earth-floored area *doma 土間. The width of the hiroshiki ranges from about 1m to 2.5m, and often varies in width even within a given house, with the area towards the rear, adjacent to the kitchen *daidokoro 台所, often being wider. Sometimes the hiroshiki was confined to the rear half of the doma only. The hiroshiki was important as an intermediate space between the kitchen daidokoro and *kamaya 釜屋, and old farmhouses such as Yoshimura 吉村 house (an early 17c, Important Cultural Property near Osaka) preserve an oral tradition that servants slept there. 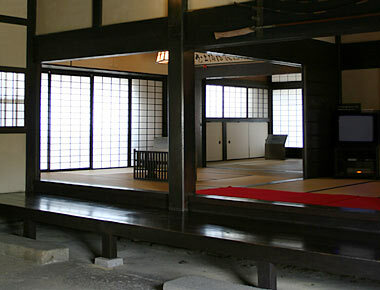 4　In Japan's oldest surviving farmhouse, Hakogi 箱木 house (an Important Cultural Property in Hyougo prefecture), believed to date from the 15c, the restoration report designates the hiroshiki as the room immediately behind the forward-facing room *omote 表 and adjacent to the doma which was essentially a kitchen. The room was enlarged by combining it with the adjacent enclosed chamber *nando 納戸 in the mid-Edo period, but when it came to be called hiroshiki is not known. 5　In vernacular houses, *minka 民家 engaged in indigo manufacture in Tokushima prefecture, a loft with boarded floor, suspended over the earth-floored area *doma 土間, and used as sleeping accommodation for maidservants. The floor area was about 4 sq.m. Also in Tokushima prefecture, a small projecting room situated between the entrance hall *genkan 玄関 and main entry *oodoguchi 大戸口 used as an office and mess room by porters and doorkeepers bannin 番人 in the houses of village headmen. 6　In vernacular house *minka 民家 in Tokyo and Saitama prefecture, a small ancillary structure in which servants could rest and sleep.